Is your writing life all it can be? Let this book act as your personal coach, to explore the writing life you already have and the writing life you wish for, and close the gap between the two. Gain insights through helpful stories from the authors’ established writing careers. Explore twelve simple (but vital) habits—through journaling, writing prompts, bonus activities, and discussion questions. The honest and witty stories help build a vision for a satisfying, sustainable writing life, while the prompts and activities on the twelve vital habits will help you make that life a reality. Also includes extra resources like "tools for the writing life," "recommended reading," "Artist Dates," "resources for writing a book proposal," and "resources for launching a writers group." Sage, surprising, endlessly useful! 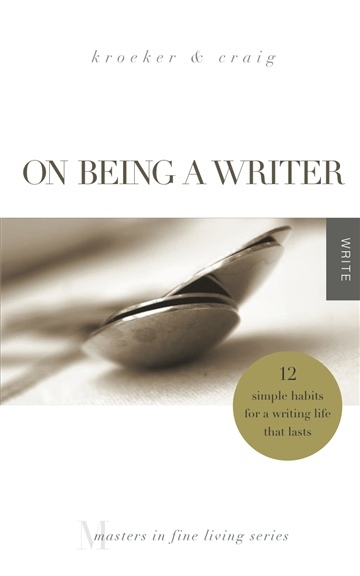 This excerpted version of On Being a Writer includes the Introduction and three full chapters. Ann Kroeker is a popular writing coach, speaker, and the author of two books, including Not So Fast. She also serves as an editor for Tweetspeak Poetry. Charity Singleton Craig is a contributing writer for Tweetspeak Poetry and a staff writer for The Curator. She also serves the communication needs of various corporate clients. "On Being a Writer is that rare guide to writing that is both practical and inspiriting. Ann Kroeker and Charity Singleton Craig show—wisely and winsomely—how the habits of writing are inextricably connected to the habits of being."